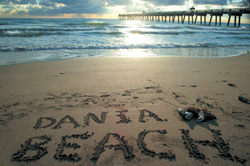 Dania Beach has always been a beautiful place to picnic, take in the sun, fish, have a family gathering or just hang out with friends. Their wooden pier stretches out about 900 feet into the Atlantic. The pier is open 24/7 and comes equipped with a tackle shop, a place to get food, and a restroom. There is a small fee to fish on this pier. You can call this number to confirm rates 954-924-3613. To the right of the pier, there is a stretch of lifeguard stands and to the left there are benches where you can enjoy food from Quarterdeck. The beach is beautiful! The turquoise waters are definitely a sight to see, the sand is perfect, and the sandbars are the money makers. What most people do not know is far down on the left side of the pier, there is a reef called the Euro Jacks Reef. My dad used to take me snorkeling there. The Euro jacks were put in to control beach erosion and have become a popular artificial reef. They are located about 100 yards off the beach. There are always magnificent angel and parrot fish, the occasional nurse shark and my favorite --- sea turtles! It is definitely a cool spot to go, even if you have never been snorkeling. Recently, Dania Beach signed a ten year lease with the Quarterdeck. This restaurant brought a lot to the table for Dania Beach. On the inside of the restaurant you can enjoy a beautiful view of the ocean, or sit at the sushi bar and watch the chefs prepare your food. The outside of the restaurant consists of an oversized patio armed with a full liquor bar. Also it gives you direct access to the pier, perfect for a family photo opt! Quarterdeck welcomes all types of crowds.